Good Seeds is a The Gourmand Award national winner in its category HISTORICAL RECIPES and international finalist. Gary Jones, Door County Peninsula Pulse, review, October 13th, 2016: Because my Wisconsin dairy farm family foraged for hickory nuts, morel mushrooms, and wild blackberries, I read with interest Thomas Pecore Weso’s new book, Good Seeds: A Menominee Indian Food Memoir. A member of the Wisconsin Menominee Nation, Weso takes readers through an indigenous culinary history of his people, every chapter devoted to a different food. Each begins by citing relevant historical text and then draws upon the author’s experiences as a youth, concluding with pertinent recipes… But while some of the recipes are relatively conventional, others seem exotic, for example, roasting porcupine, beaver tail, or bear, sometimes with barbeque sauce, or preparing milkweed, dandelion greens, or a wild rice casserole… Readers have enjoyed this informal study of a culinary culture, and appreciate the extensive bibliography included in the book. The Reading Wolf blog: This is such a great book! I enjoyed learning about the history of the land and the tribe. I haven’t tried any of the recipes yet, but I’m sure i will soon, as they seem easy enough to follow. This book takes you on a journey and immerses you in a beautiful culture and lifestyle. So many memories and beautiful tales of growing up. You really get a feel for the author as he recounts his life and immerses you chapter by chapter into his life. This book is beautiful inside and out and I loved reading it. Thank you librarything for sending me this book in exchange for my honest review. ominee Reservation, his focus being on the things he hunted, the crops he and his relatives grew, and the berries and nuts various members of the tribe gathered. The book has a quiet tone, direct, honest, charming, and curious rather than edgy or strident. The first two chapters set the mood, with grandmother cooking downstairs while grandfather prays—or “dreams,” as Weso puts it—upstairs. Subsequent chapters are devoted to fishing, hunting, and fruit-gathering, though there are also chapters about German beer and Wisconsin Diner food. Each chapter concludes with a few recipes. Macaroni blog: Weso describes growing up on the Menominee Reservation, his focus being on the things he hunted, the crops he and his relatives grew, and the berries and nuts various members of the tribe gathered. The book has a quiet tone, direct, honest, charming, and curious rather than edgy or strident. The first two chapters set the mood, with grandmother cooking downstairs while grandfather prays—or “dreams,” as Weso puts it—upstairs. Subsequent chapters are devoted to fishing, hunting, and fruit-gathering, though there are also chapters about German beer and Wisconsin Diner food. Each chapter concludes with a few recipes. Anna Maria Polidori, Book Reviews: Every chapter Weso remembers some anecdotes of his past. It can be his beautiful moments spent in the family with his granny, it can be the hunting of the bear, or fishing, – better a big fish than not a small one, he writes at some point because the family big and so… At the end of every chapter you will find delicious recipes that you are more than invited of trying for preparing delicious meals. A chapter I loved the one of maple syrup. I adore maple syrup! I drink it with water it’s the only way I use it I confess but I love also to explore the most diversified utilization in the American culture. From Books blog! 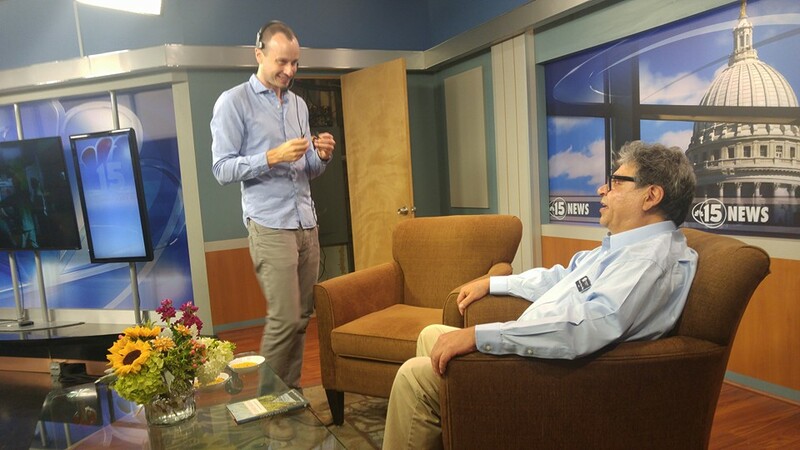 TV appearance clip, Madison, WI at NBC15 Madison about memoir, “Good Seeds.” Tom Weso reflected on how it is more than a food memoir. Discover the indigenous wild edibles that have impacted more than just the Menominee by watching the full interview, and by finding “Good Seeds” at your favorite book retailer.